Superman trains his son to use his telescopic vision but Jonathan is curious why his other vision powers haven't manifested. They discuss this as they head home and Jon suggests a race which he wins. Superman is confused by this but before he can dwell on this Jon gets weirded out that his mother isn't home to greet him. Superman explains that this may happen more now that Lois is wanting to go back to work but that doesn't mean she loves him any less. Meanwhile, back at New 52 Lois' apartment Superwoman demands to know who Pre-Flashpoint Lois is. Superwoman puts the pieces together quickly as PF Lois calls home. Superman hears that his wife might be in danger and flies off after making Jonathan promise he'll stay home. 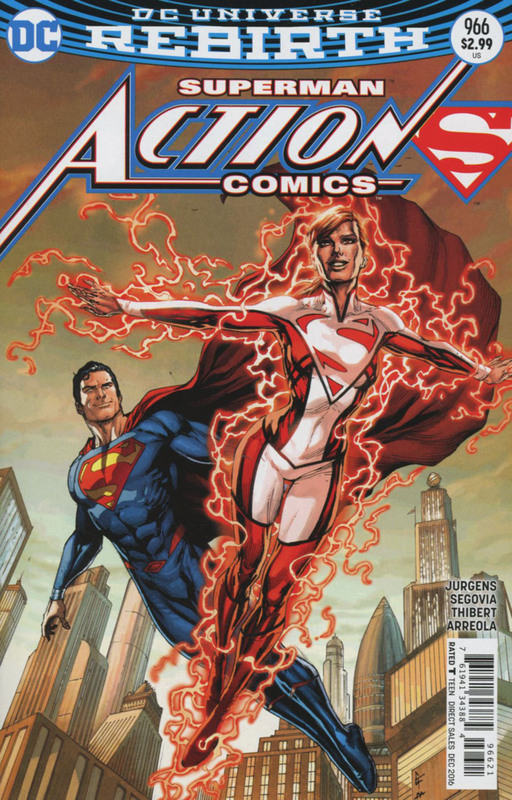 Superman arrives and Superwoman powers down revealing that she is actually New 52 Lana Lang. Lois unlocks New 52 Lois' computer and the three of them watch a message New 52 Lois had recorded in the event of her demise. She asks her doppelgänger to take over her work and to a certain extent her life so that the people she cares about won't have to suffer. Lana tells them about how Lois died right in front of her and how keeping that secret is eating her alive. She and Superman talk about if the same thing could happen to her and Lana wonders where do they go from here. Lois realizes it may be creepy but she has to honor the other Lois' last request. After a brief chat about the other Clark Kent and who he might be Lois and Superman head home and talk about what needs to be done. The next day Lois goes into the Planet and fully assumes the other Lois' life. Outside of the city the bearded man with the floating Superman symbol meets with another heavily armored man. The smaller man says that the watching and waiting is done and that the criminal of epic proportions that he's been studying will die. Story - 5: I'm not crying. You're crying. All right, I didn't cry when I read this issue. I almost did. Dan Jurgens managed to hit every heart string imaginable with this issue. Not only did he return some pieces of the Superman legend back to where I wanted to them to be he made me care more about the New 52 version of Lois Lane more than I ever did during the New 52. I didn't such a thing was possible. I think that's why I liked this issue so much. For five years I had the smallest of emotional connections to the people in Superman's life because the powers that be decided that the best way they could revamp Superman was to take away every bit of emotional support he had. The Daily Planet staff were barely in any of the titles. Having Superman and Lois together was verboten. To be fair there were a few attempts to fix this. Greg Pak made Lana a likable supporting character. John Henry Irons would pop up from time to time. Jimmy was let in on Superman's secret identity five minutes before it was revealed to the rest of the world. All of these attempts had noble intentions but they didn't quite pop the way the creative teams and the audiences wanted. Dan Jurgens has slowly been putting some of the pieces back together again during the course of his run on ACTION COMICS. Maggie Sawyer is back. There's a Clark Kent that I don't totally trust running around. Now Lois is back at the Planet, Perry isn't a jerk anymore and Allie has made two appearances and everything is starting to feel right with the world. What made this work is the fact that Jurgens is writing from the heart. I can see a certain section of the reading audience claiming that they are just rewinding the clock and putting things back to the way they were before the New 52 but I'd argue that while elements of the former versions of these characters are returning it still is the New 52 world. The Pre-Flashpoint Superman and family are just living in it. They haven't simply swept everything from the New 52 under the carpet and moved on. Jurgens and crew are taking the time to explain how this is all happening and I think that's one of the main reasons I am enjoying this so much. I don't feel like they are pandering to me as a reader. I feel like I am being given well-crafted stories that coincidentally fit in to how I want to see these characters being treated. I also liked the family dynamic that is prevalent in both this title and over in SUPERMAN. The talk between Superman and Jonathan at the beginning of the issue felt very real as did Jonathan's reaction to Lois returning home at the end. Kids can be a bit strange and some tend to roll with the punches more than others. Jonathan obviously processed his mother not being home as much while they were gone and it was nice that Jurgens avoided the unnecessary family drama of him being all mad about her going back to work. Between that, the conversation Lois and Superman have towards the end of the issue and the whole opening sequence I am emotionally invested in this family and I don't want them to go away any time soon. Art - 5: All of the minor problems I had with the art last issue were gone this time around. The opening sequence with Superman and son looked amazing as did Segovia and Thibert's take on Superwoman. I didn't even mind the flash of the angry red eyes of anger when Superman arrives at Lois' apartment because it felt warranted. Segovia and Thibert also pulled off the subtle differences between older Lois and younger Lois. I especially loved the design of the two armored guys on the very last page. While there wasn't a whole lot of action in terms of fighting this time out the art team managed to keep the pages dynamic and engaging. 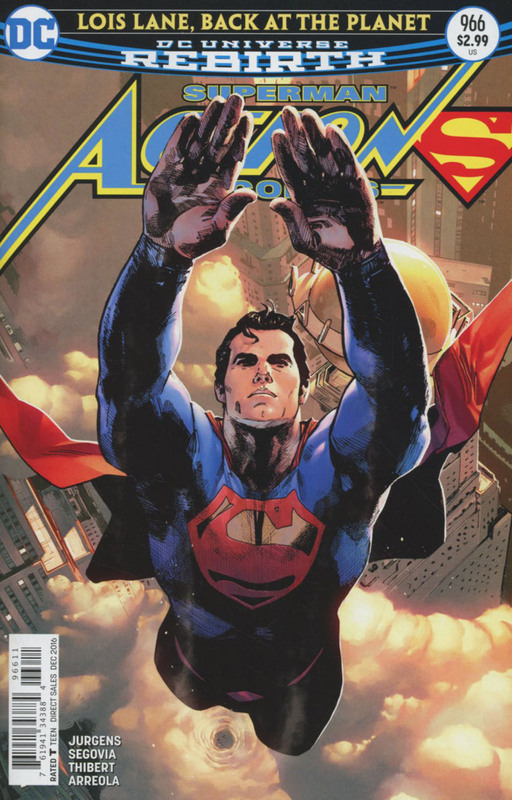 Cover Art - 5: That is a seriously Henry Cavill looking Superman. This not a complaint by any means. While it had little to do with the story inside this was a striking cover that made Superman look iconic. It is interesting to see the continued avoidance of showing the boots on the cover. Variant Cover Art - 5: Gary Frank has a good handle on Superwoman. I almost wanted this to be the main cover but as it stands this makes for a fantastic variant.